Uploaded at: 2011. 04. 21. What happens to offenders during their prison term and afterwards? What do they think about the crime they committed and the damage they caused? To what extent do they feel responsible for what happened? Do they have a sense of guilt and an urge to make things right? Do they have a way of facing and dealing with these feelings at all? What plans and opportunities do they have when starting a new life after their release? What are their chances of success in integrating into society and restoring their relationships? And what happens on the other side at the same time? How are their victims compensated for the damage they suffered? Do they have an opportunity to share their pain and loss with someone, especially with the one who made them suffer, or to ask the questions that haunt them? Who helps them deal with the trauma they suffered and move on, and in what ways? Does the justice system give them justice and how can they take part in it directly? Or: How do the parents, children and family members of the victims and offenders respond to the crime? Are they able to handle what happened? Are they able to support their loved ones in coping with the consequences and “restarting” their lives? And there are questions related to the broader community and society as well. How is the damaged community compensated as a result of the criminal justice procedure? Is there any guarantee that the released offenders will not hurt us again? Are we ready to accept released prisoners and help them integrate? If one should try to grasp the key element of any solution in a single word, it might certainly be dialogue: dialogue between offenders, victims, directly or indirectly affected family members, the professionals involved, and members of the immediate and broader community. Lacking the necessary set of tools, the traditional criminal justice system has been unable to facilitate such a dialogue. As such, it is no surprise that the restorative approach has gained ground in relation to dealing with crimes and offenders. 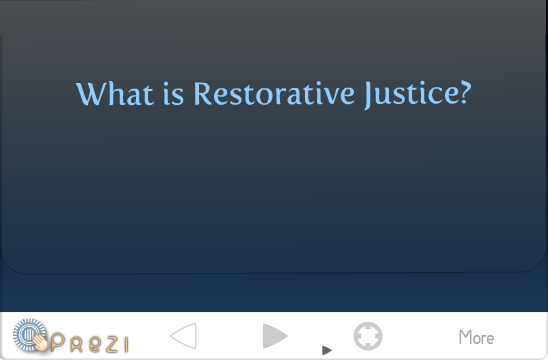 In the past two decades, restorative justice and its institutions have become increasingly recognised in most of the European jurisprudences, and have also appeared in practice. However, in most cases restorative solutions are available only prior to conviction. Only a few practices exist (especially in Belgium) that allow offenders to repair the harm they caused whilst in prison. It mainly affects those offenders and victims who are willing to engage in a restorative dialogue, which is not available in prison settings. Although there are many projects dealing with victims, offenders and the affected communities, most of them promote the use of restorative practices before conviction takes place. Based on domestic and international research findings suggesting that the restorative approach is most effective and efficient regarding serious crimes, Hungarian professionals in restorative justice, in cooperation with foreign partners, have set up a research team to study, at the national and international level, how restorative practices could be applied with offenders during their time in prison. The research programme has become known as the MEREPS project, the name of which stands for “Mediation and Restorative Justice in Prison Settings”, and it has been supported by the Criminal Justice Programme of the European Commission. Led by Hungarian researchers, the international project looks at how mediation and other restorativepractices could be applied in prison settings, with special regard to offenders who committed serious crimes. The project, which includes both theoretical and empirical research and field studies, seeks to establish and promote cooperation and dialogue between researchers, restorative professionals, legislators and legal practitioners in the countries concerned. The primary objective of the MEREPS project is to identify ways to apply mediation and restorative practices in prison settings, with special regard to providing support to victims and enabling offenders to take responsibility. It also aims to facilitate the resolution of conflicts resulting from a crime between the victim and the offender, and the offender and their environment, including other inmates, with a view to facilitating the reintegration of offenders following their release. Following the empirical work phase, the Hungarian team aims to test how restorative practices could be applied in prisons through a pilot project, which will also include very serious crimes. In the framework of the pilot project, restorative solutions will be offered both in cases of conflicts between inmates in a prison and for the resolution of conflicts between offenders and victims and family members. The MEREPS consortium includes six research groups from four European countries. The Hungarian-led project is headed by the Foresee Research Group, and operates under the professional leading of the National Institute of Criminology. Foresee’s foreign partners are the Leuven-based European Forum for Restorative Justice (Belgium), the London-based Independent Academic Research Studies (England), and two organisations from Bremen, the Hochschule Für Öffentliche Verwaltung Bremen and the Bremen Mediation Service (Germany). The domestic implementation of the project enjoys support from several high profile organisations, including the Office of Justice, the Hungarian Crime Prevention and Prison Mission Foundation, and the Hungarian Judicial Academy. The empirical research will be carried out at two locations in Hungary, the prison in Balassagyarmat and at the youth correctional centre in Tököl. Two preparation sessions for professionals and prisoners took place in Balassagyarmat. The international background of MEREPS will enable countries with extensive experience in the field to evaluate their results and determine the areas that need improvement, while also allowing Hungary to get an insight into best practices and standard procedures, and to carry out its pilot project in a professional manner. Moreover, the evaluation of the combined data from various countries may prove highly beneficial. Among other things, it may allow us to prove that the case is not simply that eastern countries have a lot to learn from the west, but rather that information exchange between the two regions might facilitate the development of restorative policies in both parts of Europe. In the third, decisive phase of the project, this Handbook seeks to support the preparation and implementation of the prison mediation pilot programme and to facilitate dialogue between stakeholders (offenders and victims, directly and indirectly affected family members, professionals, and members of the immediate and broader community). The Handbook is designed for professionals who think they can help perpetrators of serious crimes, their victims and others affected deal together with the damage caused by a crime, understand and clarify the needs of all affected people, and find ways to repair the damage done by participating as impartial mediators. The case studies from England and Hungary included in the Handbook also serve this purpose. The methods and case studies presented suggest that dialogue can be established in various ways, forms and settings, and can serve various purposes. One of the key objectives of our research and pilot programme is therefore to identify the methods that would allow the effective introduction of the restorative approach in Hungarian prisons. In the following we will present the various techniques, tools and models that may support us in reaching our goal, namely to get those affected by a crime to sit down and discuss their feelings and needs, so that they can develop a mutually acceptable solution together. We believe that this practical guide represents a small but important milestone in the adaptation and introduction of restorative practices like mediation and group conferencing, which have already been recognised and used throughout Europe and the world, in prison settings.